Based on Dutch historical records, the original Onrust was constructed in the early winter of 1614 shortly after Adriaen Block’s ship, the Tyger, burnt to the waterline, and was completed in April, less than four months later. Because of its speedy completion, it is assumed the ship was built with the leftover parts from the Tyger, together with new building materials Block’s crew obtained locally, and possibly with borrowed materials from the “Fortuyn”, the 110-ton ship that accompanied the Tyger on the voyage of 1613. Block’s crew was estimated at nine members at time of construction and included shipwright, Herman Hillebrantsen, and carpenter, Lolle Reijner. Records also mention the ship was a “small Yacht of about eight lasts (16 -ton burden) and measured 44 ½ feet in length, with a beam of 11 ½ feet and a keel of 38 feet long”. To accommodate a ten percent taller population, the present-day Onrust is built about ten percent larger than the original version, measuring instead 52 feet in length with a beam of 14 feet. The ship carries about thirty passengers plus six working cannon and sails with a four to seven-member crew. 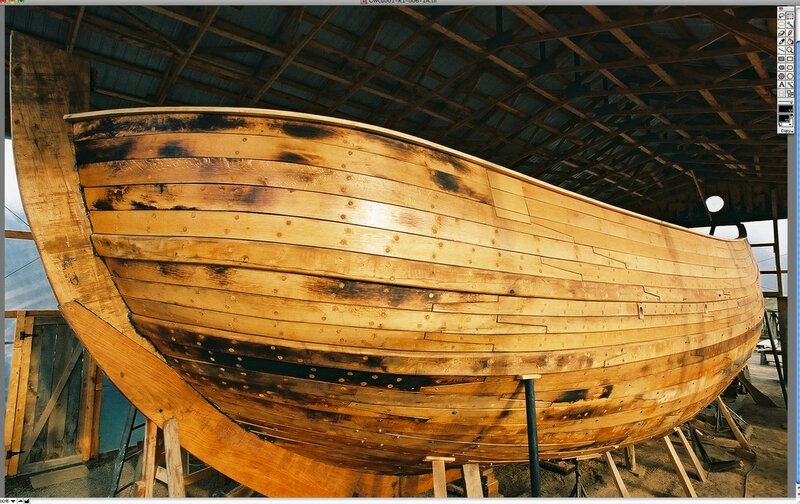 The official Onrust keel-laying took place in October of 2006 with the help of fifth grade students at the Historic Mabee Historic Site in Rotterdam Junction, NY, from where the Onrust was launched two and a half years later. A great variety of ship-types including yachts, in this view of Amsterdam in 1610. By 1610 the bustling seaport on the Amstel river was an established commercial center in the heart of Europe and the departure port for both of Adriaen Block’s ships, the Tyger and the Fortuyn a couple of years later. Within each harbor and throughout the countryside highly specialized shipyards had begun turning out hundreds of ships on an annual basis, boosted by the Dutch invention of the windmill powered sawmills. With shipbuilding in its heyday, the Dutch Republic produced more cargo ships than England, France and Scandinavia combined and Dutch shipwrights were being hired throughout Europe. Divided by more than 160 canals, and 90 islands, the city is spanned by more than a 1,000 bridges today. The “yacht” is a ship- type invented by the Dutch. The Dutch word “jacht” means the “hunt” or “chase” in English and the ship- type was given the name because of its speed. Yachts were first built by the Dutch in the late 16th century (into the 18th century) and because of their design were swift-sailing vessels. Dutch yachts were not only known for their speed, but also for their mobility and load capacity. 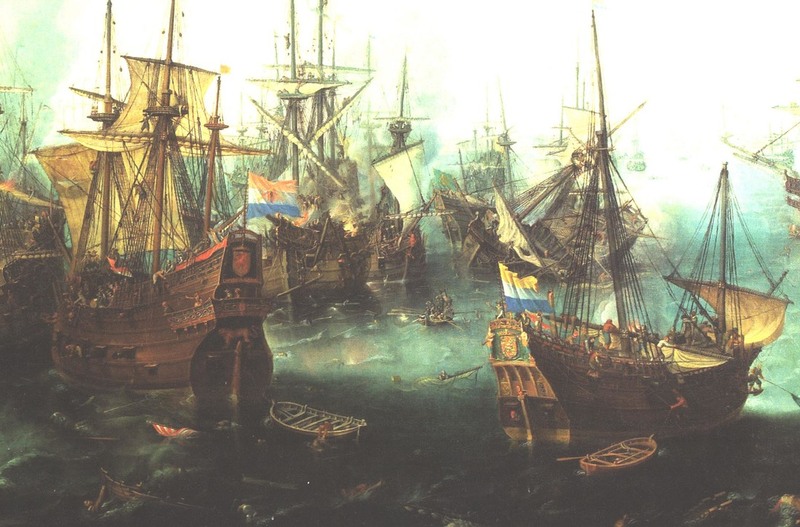 Usually of small and intermediate size, they became a very popular trading vessel in the Dutch merchant fleet, were active in naval combat and accompanied large commercial vessels on longer voyages to provide cover during unfriendly encounters or stormy weather. Only later in the 17th century some of them became known as pleasure yachts. From “The Battle of Gibraltar, 25 April, 1607” by Cornelis C. van Wieringen, 1622​. ​The yacht was easily recognizable by its flat transom stern, a flat bottom, and pronounced bows, which added more cargo space. A shallow draft enabled it to function both in shallow rivers or on the open ocean and yachts, the size of the Onrust, may have crossed the Atlantic as part of a fleet. 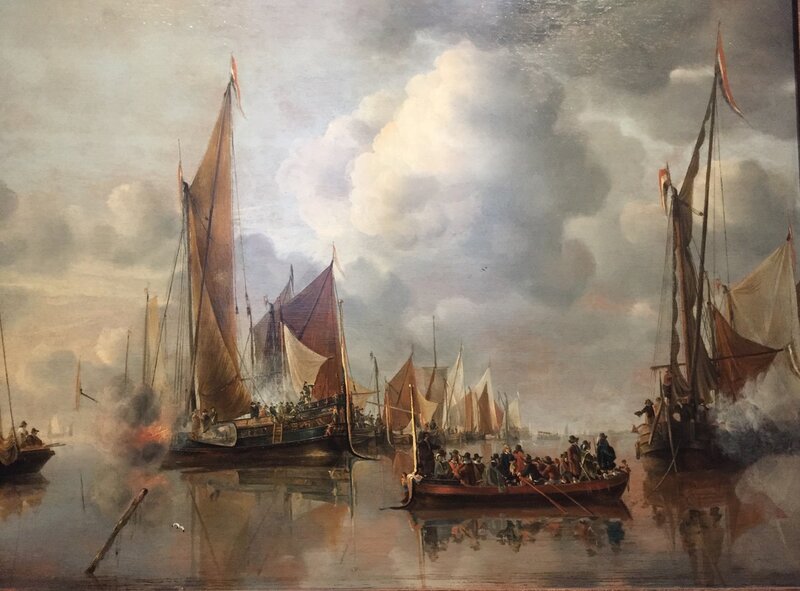 Two yachts fire a salute at a state barge rowing by (from The Home Fleet, Jan van de Capelle (1650). A centerboard was not used by the Dutch but instead leeboards on port and starboard side provided stability. A centerboard might have been unpractical for Dutch sailors who were continuously looking to expand cargo space and might have hung up easily on the many sandbars in their shallow rivers. Four hundred years ago Dutch shipbuilders did not use blueprints but built ships mostly from memory and experience and used very few or no drawings. As a result, designs of the typical yacht were lost in the 18th century once they stopped building them. Recent research however of excavated ship wrecks from drained sea beds and polders by Dutch marine archeologists at the National Institute of Ship Archeology (NISA) has shed new light on the construction methods. The Onrust became the first Dutch-style yacht to be rebuilt based on the re-discovered building methods. Designs for the Onrust were executed by Gerald De Weerdt of Maritime Designs Company, who by studying the shipwrecks at the NISA, became a specialist of 17th century Dutch shipbuilding and guided the construction process of the Onrust. In building the Onrust the Plank-First method was used. It is the older method of the two, typically Northern European, and uses cleats (wooden battens nailed across the planks) and clamps, that not only keep the planks temporarily in place but also keep them at a constant angle, gradually creating a shell shape, ending up at the bilge, where the hull starts to curve. The shallow bowl is supported by small posts underneath. 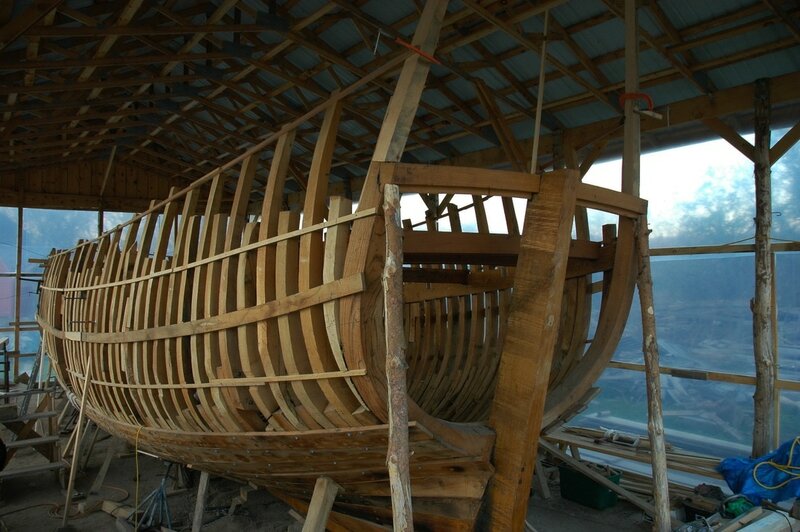 The skin of the Onrust is built in “karveel” style (carvel-built or plank-on-frame), with the edges of the planks meeting each other instead of overlapping (clinker- built or lap-strake), and with seams sealed with oakum, strands of tarred hemp fibers. ​After laying the ship’s keel on the keel blocks, the stem, stern and garboard (first strake of planks) are assembled to form the backbone of the ship. Only a few master floor timbers (six for the Onrust), are laid in strategic locations across the keel to control the shape of the bottom of ship. 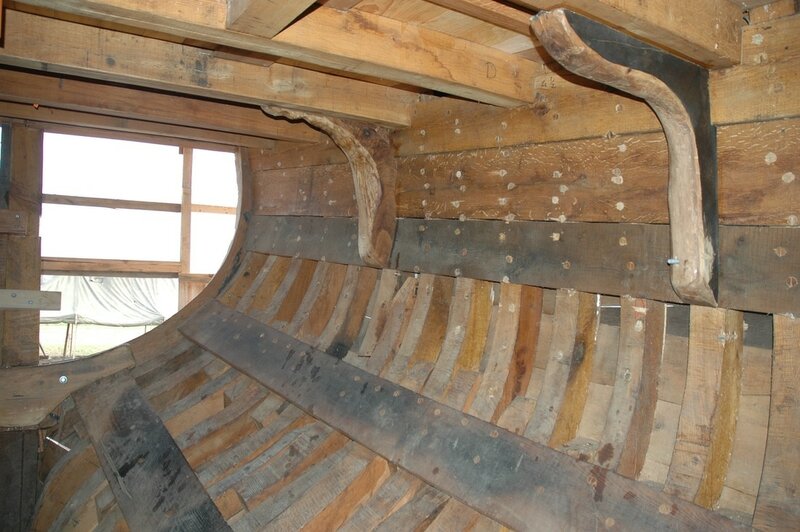 The bilge futtocks, attached to each side of the floor timber, determine the curve of the bilges. The side futtocks, which are erected to the side of the bilge futtocks, are connected at deck level by means of a planking strake, called the “scheergang”, which defines the final shape of the hull and the major dimensions of the vessel. which runs longitudinally above the keel, is put into place to further strengthen the structure. ​Next the beam wales are mounted to the inside of the side futtocks to form the support for the deck beams. This structure gives sufficient strength to add the gun wales or “berghouten” on the outside and the rest of the hull planking. Octagonal shaped wooden pegs or “trunnels” (treenails) secure the planks permanently to the frames. Onrust’s 8-inch long pegs measure 7/8 in diameter. 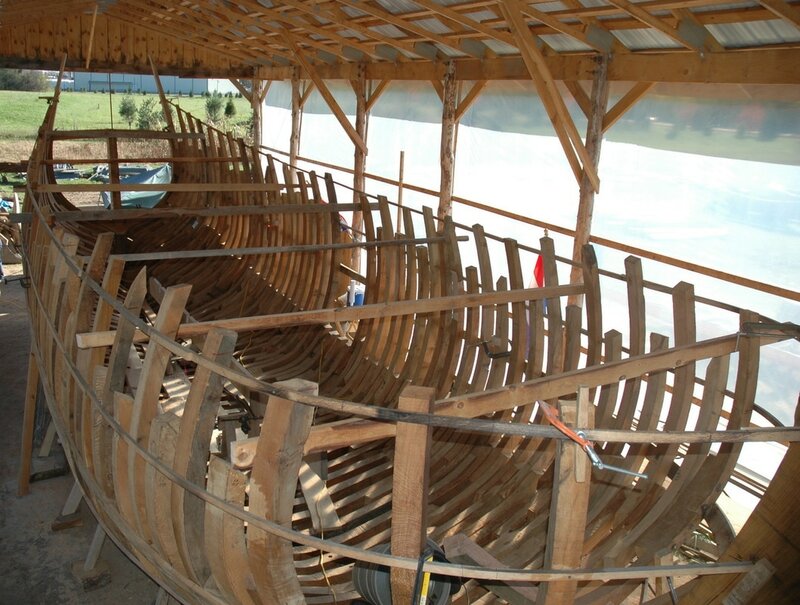 Close to 5,000 trunnels were cut out of locust (equally rot- and water- resistant as white oak and available locally) to hold the ship together. To fasten the trunnel properly, the Dutch added a wedge or "ark" on the end of the trunnel facing the inside of the ship and a wooden nail or "deutel" on the other end of the trunnel, facing the outside of ship. Close to ten thousand “arks” and “deutels” ended up in the new Onrust! Like the Dutch, quarter- sawn white oak was selected for all hull planking, frames and beams. American White Oak not only bends very easily but because tyloses membranes in the cell structure make the heartwood of this particular oak rot- and water-resistant, the species was best fitted to build the Onrust, could be obtained locally and was the preferred wood to guarantee the longevity or preservation of a traditionally- built ship. To make the planks take on the rounded shape, the Dutch made use of the fire-bending technique instead of steam bending. As heat from flames is applied to both sides of the plank, the white oak softens and obtains the desired curve while the plank is under tension. The tedious process would require three to four men to bend and twist the planks into shape, usually heating the wood several times before attaining the correct shape. All Onrust’s planking, including the two 2,5 inch- thick wales, the two bands wrapping around the entire skeleton holding the frames together, are bent in similar fashion. Following Dutch shipbuilding tradition, naturally curved wood was used for extra strength for all the ship’s frames and for the knees supporting the deck beams. 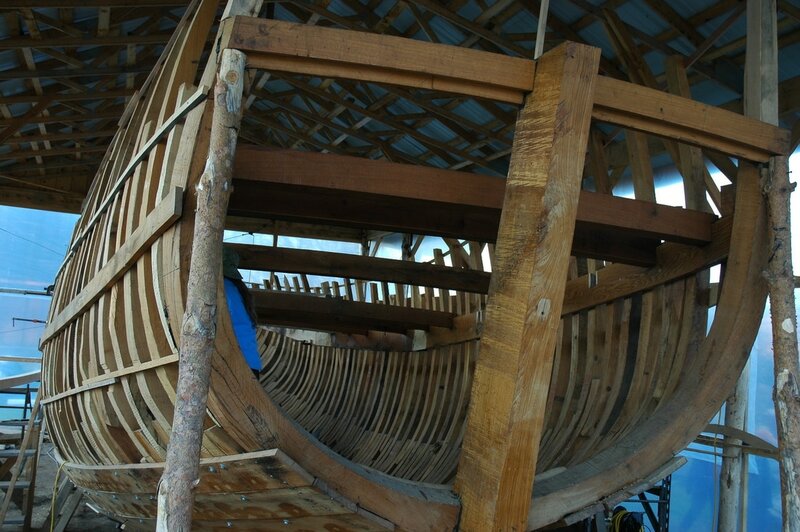 The transom pieces that are part of the flat transom stern and make the Onrust into a yacht (“spiegeljacht”), are rare naturally- curved quarter circles that make up the most curved frame on the ship. ​An interesting aspect of the relatively simple Shell-First method was that without using pre-designed drawings, the shipbuilder was able to introduce variations during the building process and design the ship while being built on site. The technique stayed very popular throughout the first half of the 17th century and also allowed Dutch shipwrights to build ships faster and in a more economical way than the English, who for the most part were building ships in the Frame-First technique during that same time period.